Summer Is About To Get A Whole Lot Better! School may be out for the summer, but not at A Scarlet Thread! It's the perfect time to indulge in a little "me" time, and we'll help you do just that with our popular Class Pass Series beginning in July. Purchase of a Class Pass entitles you to take unlimited Class Pass classes during July and August. These are quick and easy classes (2-3 hours at most!) that we've selected to enhance your sewing and quilting skills or in some cases, just because they were too cute to resist! Our staff teachers are busily creating samples of the projects and techniques they'll be teaching, but we're not quite ready to reveal all just yet (soon, I promise!) In the meantime, here's just a little teaser to pique your interest. We've planned a drop-in Open House for Saturday, July 1, 11:00am to 2:00pm, where we'll have all of the Class Pass project samples on display. You'll be able to purchase your Class Pass and make your selections for the classes you'd like to take. You're sure to find a class or two (or five or six!!!) to add to your calendar. Class sizes are limited, so don't wait if there's a "must make" project on your list. Summertime is playtime, so grab a friend or two and make plans to enjoy a Girl's Day Out as often as you can! See you in the Stitch Lounge soon! Well I am here to tell you today, that it is INCREDIBLE! The Hera Marker is a great alternative to chalk and other marking tools. It makes a very visible line that doesn’t smudge or accidentally rub off. You never have to “refill” it because it is simply a piece of white plastic. Keep reading to see how I used the Hera Marker to mark quilting lines or click here to buy a Hera Marker now! First, I began with a quilt sandwich (top layer, batting, bottom layer) that was trimmed to an even rectangle shape. Next, I used the 45 degree line on my ruler to line up with the side edge of the fabric. Then I began marking my lines leaving 1 ¾” in between each line. All you have to do is use medium-firm pressure while gliding the Hera Marker across your fabric. Easy as pie! Once all of my lines were marked in one direction, I simply turned the rectangle around, lined up the 45 degree line of my ruler with the other edge of the fabric and began marking intersecting lines. I made these lines the same width (1 ¾”) apart as the first set. So when I was done, the quilt sandwich had a very easy to see cross hatch pattern. I also used the Hera Marker to draw some other free-hand lines, including a wavy line, a zig-zag line, and a cross hatch line. The possibilities are truly endless with this tool! You could draw all kinds of free motion quilting designs, use with a paper pattern to transfer on your fabric, and so much more! You can find the Hera Marker here for just $5.99! If you haven’t heard by now, we recently launched a BRAND NEW webstore! That means you can shop from A Scarlet Thread anytime your heart desires. When you’re laying in bed at night and think of a quilt idea you have to buy fabric for right that second. When you’re working on a project and you cut something wrong, or run out of fabric with one block left. We are always open online! What’s special about our website? We have more than just fabric, including notions, patterns, gift cards, and more! Every week we are adding new products and new services. Coming soon, we will be offering Class Registration online and Mail-In Long Arm Quilting Services! Before these were things you could only take advantage of if you lived near us and came in store, but now you can choose your quilting designs, plan your next quilt, and shop new arrivals all from the comfort of your home! For our local customers, we haven’t forgotten about you! We offer a full page called, “Hey Locals!” that is home to all of our in-store events and club details. We also give you the option to select “in-store pickup” when you place your order. That means you don’t have to pay shipping and when you come in the store to pick-up your order everything is already cut and ready to go! Lastly, we love to see your projects! One of the best things about working in a quilt store is to see a customer bring in a finished project that you helped them with from the beginning. We also love to see our online customer’s projects too! At anytime, you can send us pictures of your finished projects or tag us on social media and we just might feature you in our “Customer Projects” section! We hope to see you shopping online! There are many health benefits to quilting. It reduces stress and brings about a state of well-being, and most of us find it to be a relaxing hobby. While you may not think so, quilting is also a very physically demanding hobby. As quilters, we often put excessive demands on our bodies without being conscious of doing so; how many times have you continued working even though your hands are aching and your eyes can barely focus? It's not unusual to continue working through discomfort when your focus is on finishing an important project. Sooner or later, though, you will find yourself feeling the effects of pushing your body to the limit - maybe you can't quilt as much as you would like because your body is sore, or you begin to limit the size of your projects and their complexity because you physically can't do more. Think about the last marathon quilting session you had - did your back hurt, or your hands feel tight, or maybe you developed a splitting headache. What's the answer? Get up and move! I'm not advocating a strenuous exercise program (although if you don't exercise regularly I do encourage you to start! ), but it's important to learn to listen to your body. Any time you hold or repeat a position for an extended period of time you are going to feel it. Varying your position will help prevent aches and pains. I know many quilters who set up their sewing area with everything within easy reach so they never have to get up - they just swivel one way to press and the other way to cut and trim. I deliberately have my ironing board set up in another room, which forces me to stand up and move often. If I'm dug in for a marathon sewing session, I will set a kitchen timer for 20 minutes and I'll get up and walk downstairs to the opposite end of the house and back. I've even been known to do 15 or 20 jumping jacks if I'm really feeling stiff! The point is to take frequent breaks and throw in some sort of activity to get the blood flowing. Stretching enables our muscles to work effectively and decreases the risk of injuries. If you are doing a lot of cutting or handwork, hand and wrist exercises are crucial. As little as two minutes every couple of hours using these simple exercises will help reduce the pain and stiffness caused by overuse of hands and wrists. Good posture is important while you're sewing, and I'm sure I don't have to tell you what a difference the right chair and table height can make. Even so, often we feel tension in our neck and shoulders first. Here's a simple stretching exercise you can do right at your machine. Slowly turn your head to the left and then to the right several times. Lower your head slowly to your chest and then return to normal position several times; finish by shrugging your shoulders several times. Don't strain, just stretch s-l-o-w-l-y. If stretching exercises are new to you, just do a Google search for basic stretches to find what works for you. I love yoga for staying limber, and some of my favorite stretches can be found at this link Yoga Stretches at Your Desk, and they can all be done from the comfort of your chair. It's easy to fall into bad habits when we have a chance to indulge our love of quilting. Being mindful of how important good habits are for our body, and moving and stretching will just make the experience more enjoyable in the long run. So next time you're quilting remember to get up and move! Spring is here and summer will be here before you know it! Time to rotate that wardrobe. If you are like me there isn't much to rotate. Years ago my husband and I moved every couple of years when he would get a promotion so it didn't matter if I kept wearing the same old clothes because I had new friends that hadn't seen them. Presently we had lived in Georgia for almost 13 years and my clothes are tired! This year I am going to try something different. I want to give my clothes new life. I am going to add some embroidery to spruce them up. When I am demonstrating an embroidery machine customers often say they don't know what to use it for or how much they would use it. I say "You can't use what you don't own!" Embroidery opens up a whole new wonderful world. 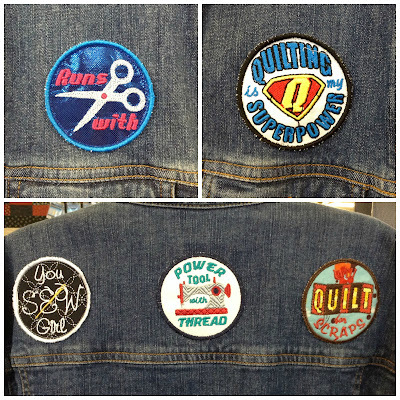 By adding an embroidery design to a garment you already own it's like shopping in your own closet. We have the cutest embroidery designs from Lunch Box Quilts here at A Scarlet Thread. They are Patches N' Pincushions and retail for just $33.99! Each design comes digitized in either a patch or pincushion version. I have had the above denim jacket for a few years and was almost ready to throw it out but instead just added the embroidery patches to it. Now I have a "new-to-me" garment ready for spring. 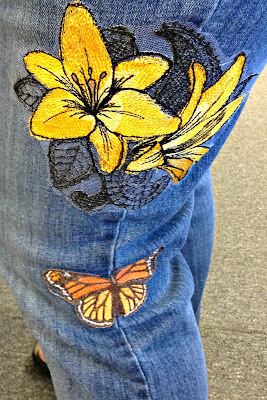 The embroidery designs on my jeans are from Urban Threads. I stitched them on wash-away stabilizer and then stitched them on my jeans using a regular sewing machine. The Baby Lock machines have a pivot feature that is great for this type of work. I just activated the pivot and started sewing. Each time I stopped sewing the foot pops up and the needle stays down. This allowed me to turn my jeans without having to raise the foot each time manually. What a great time saver and made sewing much easier.